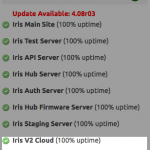 Our Iris System Monitor now supports V2! 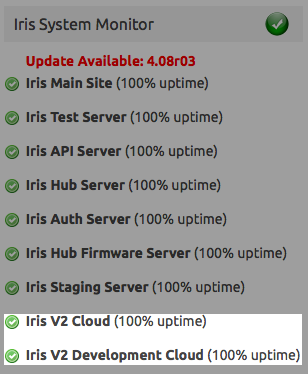 We have updated our Iris System Monitor to track the uptime of the new V2 platform. As with the legacy V1 monitors, out monitoring system will check and report the status of the V2 cloud servers every 5 minutes. The system monitor does not currently check or report the latest hub firmware but we plan to add that capability in the future.